VeniceBox is a very simple and user-friendly package that lets you exploit its numerous benefits so you can enjoy your stay in Venice without worrying about time and money. To provide you with discounts and promotions at any of the city's main stores and restaurants; whether you are shopping for souvenirs, parking or enjoying a spa. Check the up-to-date list of affiliated businesses – there's over 50 of them and more and more stores and businesses are becoming VeniceBox affiliates. To move around by vaporetto or bus in Venice proper and the mainland areas of Mestre and Marghera. The Lido area is excluded, as are trips to and from the Marco Polo airport. The Pass validity period depends on type of package you buy. The validity periods range from one to three days. You activate the pass by using it (it features a microchip). When buying online, different validity periods are available, as are other means of transport or affiliates. Examples of this would be parking facilities, airport shuttle, and so on). You get coupons to use at affiliated stores. Each coupon will show clear directions to the store. Use the coupon when making a purchase. A brand new map to make it easy to get around Venice and even to stay off the beaten path. The map also specifies emergency numbers as well as key navigational features. This pass is included in certain packages only. It gives you free admittance to museums in the Saint Mark's circuit: that is, the Ducale Palace, The Correr Museum, The National Archeological Museum, and the monumental rooms at the National Marciana Library. If you buy VeniceBox online you can add other museums to the list that's in you package. At any rate, by showing your pass you'll be able to skip any queue thanks to your preferred admittance status. 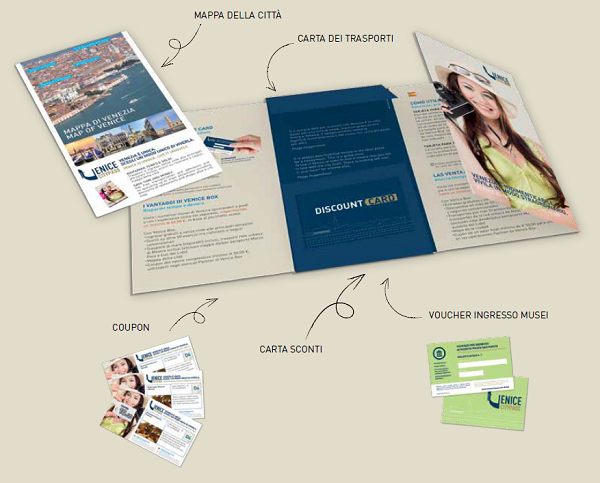 You can include in your VeniceBox also the transfer from the airport (both Venice Marco Polo and Treviso Canova). You can also choose the one-way from the airport to Venice, or the full package including also the return back (within 7 days). It grants you access to the most important churches of Venice, where there are some treasures and incredible paintings like Tiziano, Canova,.. instead of paying 3€ for each entrance, you can have them all included in your VeniceBox saving a lot of money. To find out about all of available packages and choose the one that's best for you, view the packages section. Don't you find it worthwhile? Call us right away and buy VeniceBox! !